At Giant Printing, we design and build our Truss Display Systems to create the ultimate display experience for your brand or business. Our systems are customizable, versatile, and have a wide array of set up and size choices. We understand that some situations require a smaller truss system than our regular product. Even so, a smaller display system can still make quite an impact, especially when we are the ones behind it. Giant Printing is proud to introduce the 10ft. The entire 10’ Pop-Up Truss Display fits in a lightweight, portable shipping case on wheels. The case turns into a counter table at your trade show. The 10ft. 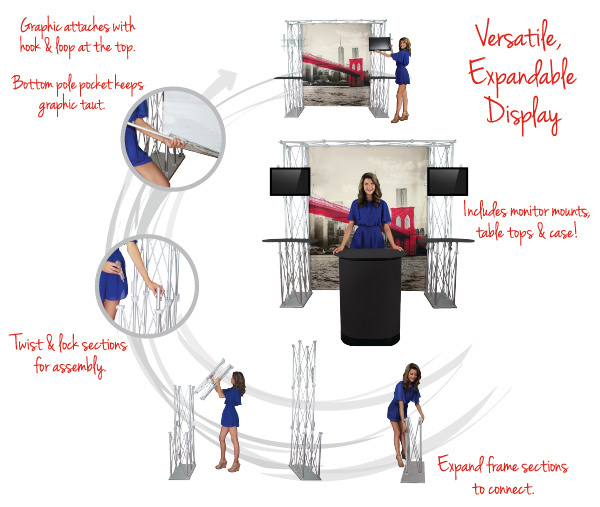 Pop-Up Truss Display kit includes the fabric graphic and all the pieces needed to assemble the frame, two counters, and two monitor mounts. You can assemble the 10ft. Pop-Up Truss Display in a matter of minutes and without pulling out all any tools. All you need to do is simply twist and lock the pieces together until you finish the set. Easily assemble all the pieces with no fear, even moments before your trade show starts. Just like all the other Giant Printing products, the 10ft. Pop-Up Truss Display is a versatile system that has multiple functions for your display needs. Each display system includes two counters, which increases your presentation options and allows you to hold more items such as business cards and brochures. In addition, the system comes with two monitor mounts for two TV displays. The portable rolling display case that contains the kit pieces also functions as a counter height table, saving you both space and money. The 10ft. Pop-Up Truss Display provides multiple features at an affordable price. With this display system, your graphic will remain the centerpiece of your presentation, while also staying still and secure. The fabric graphic attaches with a Velcro on the frame top. Meanwhile, a supplied pole weighs down the bottom of your graphic. In addition, Giant Printing will continue to provide you with any high-quality graphics you need. We do our own fabric printing at our facility, using only American-made fabric. We produce graphics for all truss systems, even if you bought your Pop-Up Truss Display from somewhere else. Rely on us for all your graphics needs. Even though the 10ft. Pop-Up Truss Display is a smaller version of our existing Truss Display System, it still has its advantages. In addition to its multiple functions and adaptability, it also provides the perfect size for a more intimate, focused booth space. 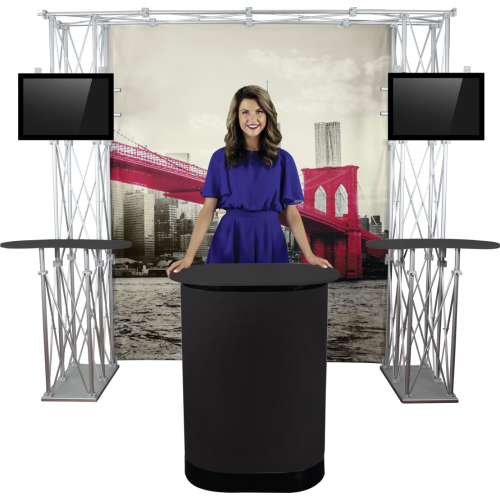 With assembled dimensions of 118.19″W x 93.63″H x 25.5″D, the 10’ Pop-Up Truss Display strikes the right balance between being large enough to fill your trade show booth but small enough to create a personal experience with any onlooker or audience member.